Remember What We Said About Easy? Set up a custom dashboard. Create a gauge component for a dashboard. 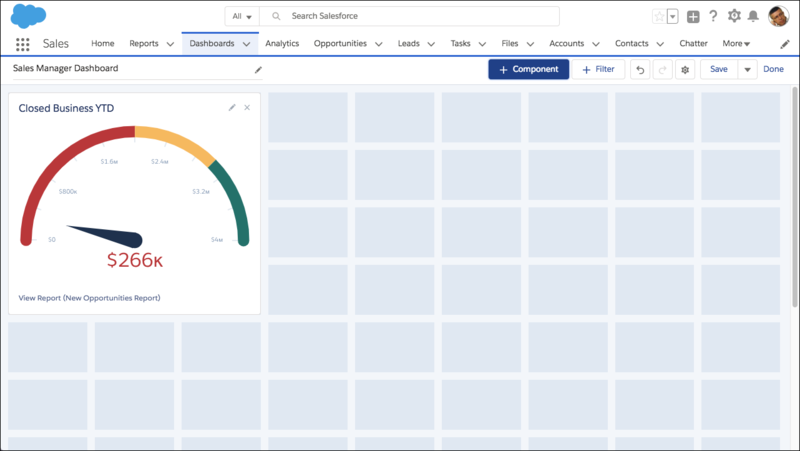 Create a bar chart component for a dashboard. Here’s the part that can really impress managers. Instead of having to view each report individually, Maria’s going to provide Ursa Major’s sales managers with at-a-glance visuals right on their home page. 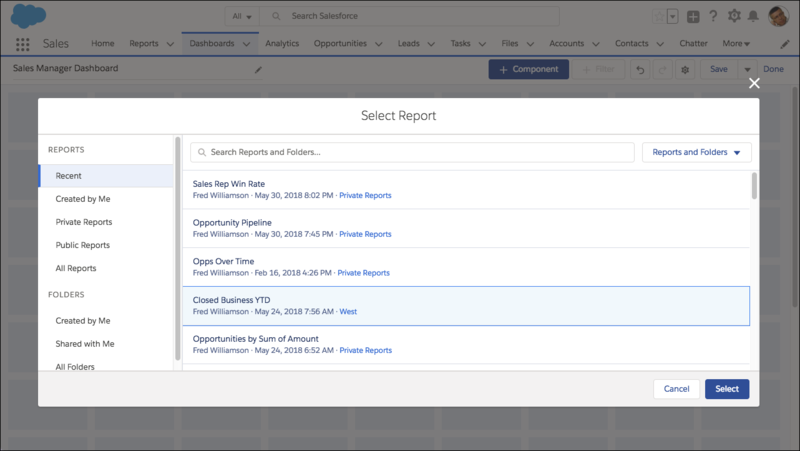 Managers can check the updated status of each report every time they load their home page. Name the dashboard Sales Manager Dashboard. Give it a description, then click Create. 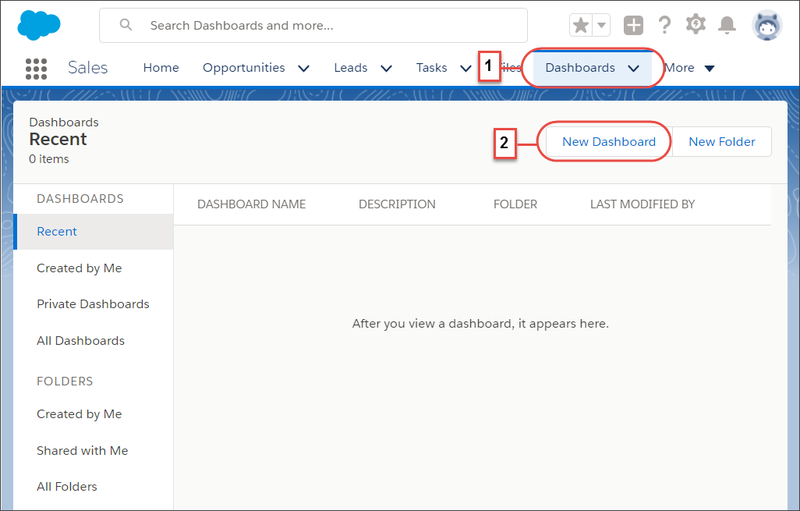 Now that Maria created the dashboard, she adds dashboard components based on the reports she created for Ursa Major’s sales managers. At this point, she thinks about how best to display the data in each report. The gauge is a great way to display a total amount compared against a goal. Maria’s going to use it to show how close Ursa Major is to hitting its annual sales target of $4,000,000. Showing the sales team’s progress toward their goal as a visual graphic makes it quick to view and easy to remember. Optionally, add a subtitle and footer. Maria wants the gauge to be the first dashboard component, so she leaves it in the top left–hand corner of her dashboard. Maria’s sales managers want to know how their reps stack up. Maria’s going to use a vertical bar chart to show which reps have the most deals in their part of the pipeline. Select the Pipeline by Rep report. 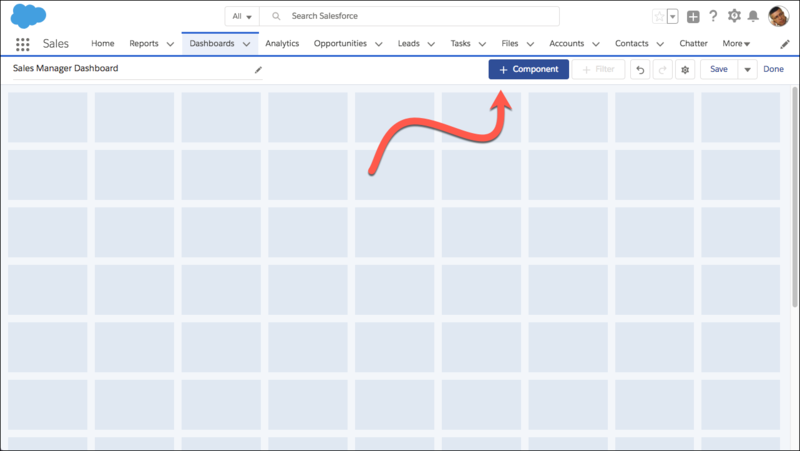 Click the Pipeline by Rep component and drag it to the right of the Closed Business YTD gauge. Which rep’s on top of all their deals? Maria’s going to use another bar graph—this one with horizontal bars—to show managers who’s closest to closing all their deals. Select the Sales Reps Win Rate report. 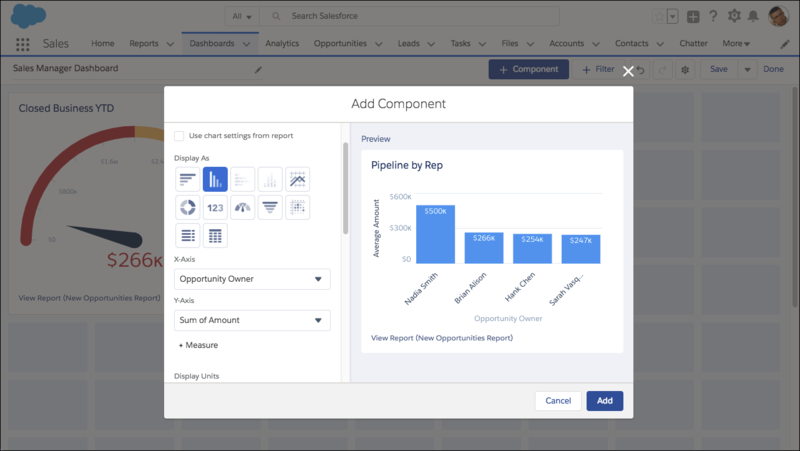 Click the Sales Rep Win Rate component and drag it to the right of the Pipeline by Rep chart. Now the dashboard has three components, one for each report she set up. 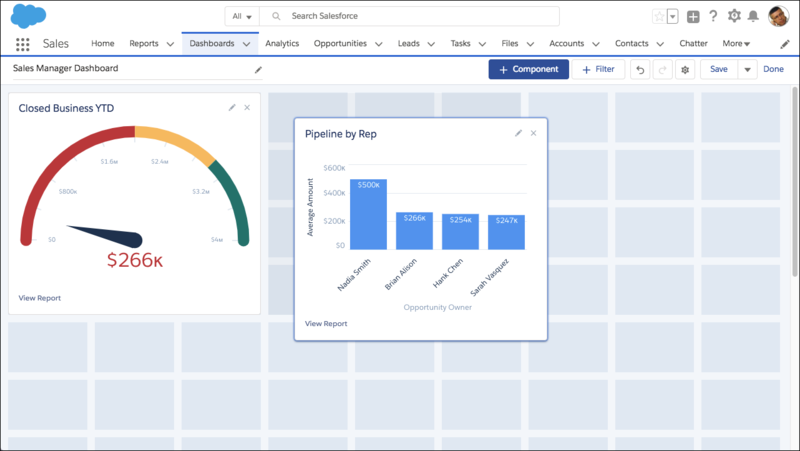 After Ursa Major’s implemented Salesforce, the components will be filled with data. Folders are a great way to organize reports and dashboards. When Maria is ready to distribute her reports and dashboards to sales teams, she’ll create some folders to organize them in. Maria’s made some great reports and set up an awesome dashboard. 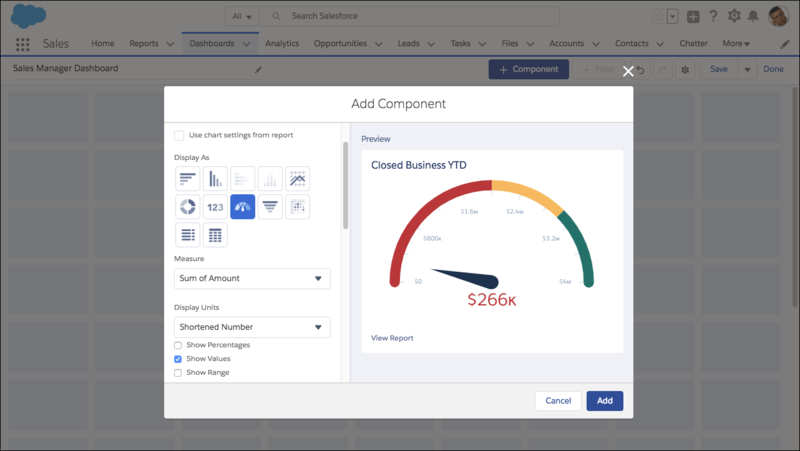 But there’s another way to get started with reports: Download them from Salesforce AppExchange. Right now, Ursa Major’s reporting needs are small, and she can set up all the reports the company needs. In the future, she can consider getting some more reports from AppExchange.